The moment magnitude scale is a measure of n earthquake's magnitude based on its seismic moment, expressed in terms of the familiar magnitudes of the original "Richter" magnitude scale. Tumaco is a port city and municipality in the Nariño Department, Colombia, by the Pacific Ocean. It is located on the southwestern corner of Colombia, near the border with Ecuador, and enjoys of hot tropical climate. Tumaco is inhabited mainly by Afro-Colombians and some indigenous people. The Malpelo Plate is a small tectonic plate located off the coasts west of Ecuador and Colombia. It is the 57th plate to be identified. It is named after Malpelo Island, the only emerged part of the plate. It is bounded on the west by the Cocos Plate, on the south by the Nazca Plate, on the east by the North Andes Plate, and on the north by the Coiba Plate, separated by the Coiba Transform Fault (CTF). This microplate was previously assumed to be part of the Nazca Plate. The Malpelo Plate borders three major faults of Pacific Colombia, the north to south striking Bahía Solano Fault in the north and the Naya-Micay and Remolino-El Charco Faults in the south. The 1958 Ecuador–Colombia earthquake struck the coastal regions of Ecuador and Colombia on January 19 with a surface wave magnitude of 7.6 at 9:07 local time. Approximately 30 percent of Esmeraldas (Ecuador) was destroyed, including the children's department of the hospital, where three children died. In all, 111 persons died and 45 were injured as a result of the earthquake. Water mains were broken and power transmission lines were damaged. The Esmeraldas-Quito highway collapsed at many places. Many other roads of the country were made impassable by cracks and fallen trees. According to press reports, a landslide from the slopes of the Andes at Panado village buried a hundred people. The earthquake was destructive in the cities on the northern coast of the country and was strong from Latacunga to Quito, Ibarra and Tulcán. It was felt at Guayaquil. 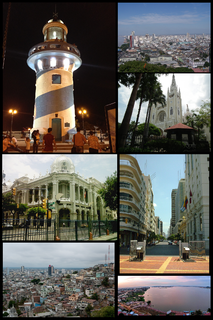 Guayaquil, officially Santiago de Guayaquil, is the largest and most populous city in Ecuador. with 2,578,201 people in the metropolitan area, as well as the nation's main port. The city is the capital of Guayas Province and the seat of Guayaquil canton. Esmeraldas is a coastal city in northwestern Ecuador. It is the seat of the Esmeraldas Canton and capital of the Esmeraldas Province. It has an international sea port and a small airport. Esmeraldas is the major seaport of northwestern Ecuador, and it lies on the Pacific coast at the mouth of the Esmeraldas River. It is exactly at the antipodes of Padang, Indonesia. The city is the principal trading hub for the region's agricultural and lumber resources, and is the terminus of the 313-mile (504-km) Trans-Ecuadorian Pipeline from the oil fields in northeastern Ecuador. Quito is the capital and the second largest city of Ecuador, and at an elevation of 2,850 metres (9,350 ft) above sea level, it is the second-highest official capital city in the world, after La Paz, and the one which is closest to the equator. It is located in the Guayllabamba river basin, on the eastern slopes of Pichincha, an active stratovolcano in the Andes Mountains. With a population of 2,671,191 according to statistical projections (2019), Quito is the most populous city in Ecuador. It is also the capital of the Pichincha province and the seat of the Metropolitan District of Quito. The canton recorded a population of 2,239,191 residents in the 2010 national census. In 2008, the city was designated as the headquarters of the Union of South American Nations. The Carnegie Ridge is an aseismic ridge on the Nazca Plate that is being subducted beneath the South American Plate. The ridge is thought to be a result of the passage of the Nazca Plate over the Galapagos hotspot. It is named for the research vessel Carnegie, which discovered it in 1929. A slow earthquake is a discontinuous, earthquake-like event that releases energy over a period of hours to months, rather than the seconds to minutes characteristic of a typical earthquake. First detected using long term strain measurements, most slow earthquakes now appear to be accompanied by fluid flow and related tremor, which can be detected and approximately located using seismometer data filtered appropriately. That is, they are quiet compared to a regular earthquake, but not "silent" as described in the past. The 1992 Nicaragua earthquake occurred off the coast of Nicaragua at 6:16 p.m. on September 2. Some damage was also reported in Costa Rica. At least 116 people were killed and several more were injured. The quake was located in an active zone of stress and deformation. It created tsunamis disproportionately large for its surface wave magnitude. The Sunda megathrust is a fault that extends approximately 5,500 km (3300 mi) from Myanmar (Burma) in the north, running along the southwestern side of Sumatra, to the south of Java and Bali before terminating near Australia. 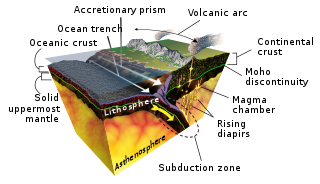 It is a megathrust, located at a convergent plate boundary where it forms the interface between the overriding Eurasian plate and the subducting Indo-Australian plate. It is one of the most seismogenic structures on Earth, being responsible for many great and giant earthquakes, including the 2004 Indian Ocean earthquake and tsunami that killed over 230,000 people. 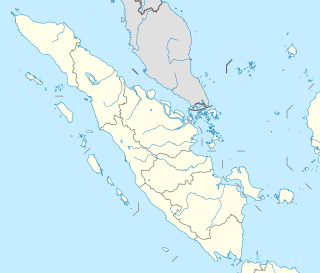 The Sunda megathrust can be divided into the Andaman Megathrust, Sumatra(n) Megathrust and Java(n) Megathrust. The Bali-Sumbawa segment is much less active and therefore does not have the "megathrust" term associated with it. The 1861 Sumatra earthquake occurred on February 16 and was the last in a sequences of earthquakes that ruptured adjacent parts of the Sumatran segment of the Sunda megathrust. It caused a devastating tsunami which led to several thousand fatalities. The earthquake was felt as far away as the Malay peninsula and the eastern part of Java. The rupture area for the 2005 Nias–Simeulue earthquake is similar to that estimated for the 1861 event. The 1965 Rat Islands earthquake occurred at 05:01 UTC, on 4 February. It had a magnitude of 8.7 and triggered a tsunami of over 10 m on Shemya Island, but caused very little damage. The 1303 Crete earthquake occurred at about dawn on 8 August. It had an estimated magnitude of about 8, a maximum intensity of IX (Violent) on the Mercalli intensity scale, and triggered a major tsunami that caused severe damage and loss of life on Crete and at Alexandria. The 2002 Sumatra earthquake occurred at 01:26 UTC on 2 November. It had a magnitude of 7.3 on the moment magnitude scale with an epicenter just north of Simeulue island and caused three deaths. This earthquake is regarded as a foreshock of the 2004 Indian Ocean earthquake, which had an epicenter about 60 km to the northwest. The 1944 Tōnankai earthquake occurred at 13:35 local time on 7 December. It had an estimated magnitude of 8.1 on the moment magnitude scale and a maximum felt intensity of greater than 5 shindo. It triggered a large tsunami that caused serious damage along the coast of Wakayama Prefecture and the Tōkai region. Together the earthquake and tsunami caused 3,358 casualties. A tsunami earthquake triggers a tsunami of a magnitude that is very much larger than the magnitude of the earthquake as measured by shorter-period seismic waves. The term was introduced by Hiroo Kanamori in 1972. Such events are a result of relatively slow rupture velocities. They are particularly dangerous as a large tsunami may arrive at a coastline with little or no warning. A tsunami is a sea wave of local or distant origin that results from large-scale seafloor displacements associated with large earthquakes, major submarine slides, or exploding volcanic islands. The 1746 Lima–Callao earthquake occurred at 22:30 local time on 28 October with a moment magnitude of 8.6–8.8 and a maximum Mercalli intensity of XI (Extreme). The epicenter was located about 90 km (56 mi) north-northwest of the capital Lima, which was almost completely destroyed, and the subsequent tsunami devastated the port city of Callao. It was the deadliest earthquake in Peru’s history prior to the 1970 earthquake. The 1932 Jalisco earthquakes began on June 3 at 10:36 UTC with a megathrust event that registered 8.2 on the moment magnitude scale. With a maximum perceived intensity of X (Extreme) on the Mercalli intensity scale, at least 400 deaths were caused in Mexico and neighboring Guatemala. It was the first of a series of seismic events that affected parts of western Mexico during the month of June 1932, all reaching magnitude 7 or greater. The 1953 Tumbes earthquake occurred on December 12 at 12:31:29 local time near the border between Peru and Ecuador. The shock had a moment magnitude of 7.5, a maximum Mercalli Intensity of VIII (Severe), and occurred in the northwestern offshore area of Tumbes, Peru. The 1981 Playa Azul earthquake occurred on October 24, 1981, at 21:22 local time. It was located near Playa Azul, Michoacán, Mexico. The magnitude of the earthquake was Mw 7.2, or Ms 7.3. Three deaths were reported, two from Michoacán and one from Mexico City. Some buildings were damaged in both Michoacán and Mexico City. A small tsunami was registered in Acapulco with a maximum height of 9 cm. The 1942 Peru earthquake occurred on August 24 at 17:50 local time and was located near the border of the departments of Ica and Arequipa, Peru. It had a magnitude of Mw 8.2 or Ms 8.4. The 1787 New Spain earthquake, also known as the San Sixto earthquake, occurred on 28 March at 11:30 local time. 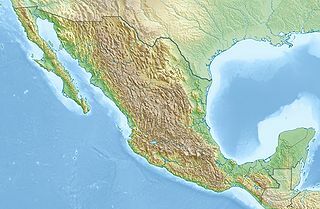 It caused a large tsunami that affected the coast of the Puebla Intendancy and the Oaxaca Intendancy in Southwestern Mexico. With an estimated magnitude of 8.6 on the moment magnitude scale, it was more powerful than any instrumentally recorded Mexican earthquake. The Romeral Fault System is a megaregional system of major parallel and anastomosing faults in the Central Ranges of the Colombian Andes and the Cauca, Amagá, and Sinú-San Jacinto Basins. The system spans across ten departments of Colombia, from northeast to south Bolívar, Sucre, Córdoba, Antioquia, Caldas, Risaralda, Quindío, Valle del Cauca, Cauca and Nariño. The fault zone extends into Ecuador where it is known as the Peltetec Fault System. The in detail described part of the Romeral Fault System south of Córdoba has a total length of 697.4 kilometres (433.3 mi) with a cumulative length of 1,787.9 kilometres (1,110.9 mi) and runs along an average north to south strike of 017.6 ± 16, cross-cutting the central-western portion of Colombia. 1 2 Kanamori, H.; McNally, K.C. (1982). "Variable rupture model of the subduction zone along the Ecuador-Colombia coast" (PDF). Bulletin of the Seismological Society of America. 72 (4): 1241–1253. Retrieved 26 August 2012. 1 2 3 4 National Geophysical Data Center. "Comments for the Significant Earthquake" . Retrieved 25 August 2012. 1 2 White, S.M.M. ; Trenkamp R. & Kellogg J.N. (2003). "Recent crustal deformation and the earthquake cycle along the Ecuador-Colombia subduction zone" (PDF). Earth and Planetary Science Letters. 216 (3): 231–242. Bibcode:2003E&PSL.216..231W. doi:10.1016/S0012-821X(03)00535-1. Archived from the original (PDF) on 2011-07-20. Retrieved 25 August 2012. ↑ Herd, D.G. ; Youd, T.L. ; Meyer, H.; Arango, J.L. ; Oerson, W.J. ; Mendoza, C. (1981). "The Great Tumaco, Colombia Earthquake of 12 December 1979". Science . 211 (4481): 441–445. Bibcode:1981Sci...211..441H. doi:10.1126/science.211.4481.441. PMID 17816596 . Retrieved 25 August 2012. 1 2 3 Soloviev, S.L. ; Kim K. & CGO Staff (1997). Catalog of Tsunamis in the Pacific, 1969–1982. DIANE Publishing. pp. 131–132. ISBN 978-0-7881-3931-4 . Retrieved 27 August 2012. ↑ Restrepo, J.D. ; Kjerfve B. (2000). "Water Discharge and Sediment Load from the Western Slopes of the Colombian Andes with Focus on Rio San Juan" (PDF). The Journal of Geology. 108 (1): 17–33. Bibcode:2000JG....108...17R. doi:10.1086/314390. PMID 10618188 . Retrieved 25 August 2012. 1 2 National Geophysical Data Center. "Comments for the Tsunami Event" . Retrieved 25 August 2012. ↑ García, L.E. (1984). "Development of the Colombian Seismic Code" (PDF). Proceedings of the Eighth World Conference on Earthquake Engineering. Earthquake Engineering Research Institute. pp. 747–754. Retrieved 25 August 2012. ↑ Garcia, L.E. ; Perez A. & Bonacci J. (1996). "Cost implications of drift controlled design of reinforced concrete buildings" (PDF). Paper No. 548, Eleventh World Conference on Earthquake Engineering. Elsevier . Retrieved 25 August 2012. • Paris, Gabriel; Michael N. Machette; Richard L. Dart, and Kathleen M. Haller. 2000. Map and Database of Quaternary Faults and Folds in Colombia and its Offshore Regions , 1-66. USGS. Accessed 2017-06-20. • Various, Authors. 2014. 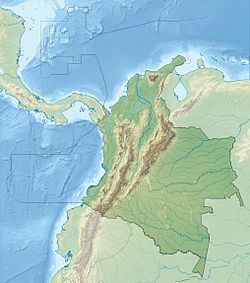 Enciclopedia de desastres naturales históricos de Colombia , 1-21. Universidad del Quindío. Accessed 2017-06-20.